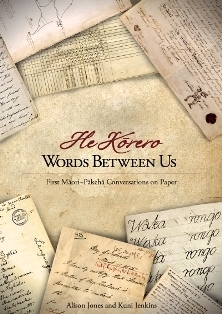 Words Between Us was published late in 2011, just as the final touches were being put to my own The Meeting Place: Maori and Pakeha Encounters, 1642-1840. That was too late to even note the publication of this new work. It is only now, therefore, that I have had an opportunity to read the Jones and Jenkins book. I’m pleased I have done so. Some books can be a chore to read. This is not one of them. The story of early Maori engagement with writing is told with considerable skill. Examining several copybooks in which Maori boys learned to write at one of the missionary schools in the 1820s set the authors off on a journey to discover how Maori first encountered writing and what it might have been like ‘to take up a European technology that, by some obscure power, seemed to be able to speak in the language of the local people’ (p 3). They do so by way of an ‘image-led story’ in which each of the sixteen discrete essays is tied to a particular historical document or set of artefacts that are reproduced in the book and themselves form a crucial part of the narrative. Those documents include ‘the first collected Maori vocabularies from the eighteenth century; a famous map drawn by Tukitahua in 1793; a letter written to Ruatara in 1814; alphabet letters copied by Hongi Hika in 1814; Tara’s cross on a letter in 1816; ta moko signatures on the first land deeds in 1815 and 1819; the first school roll from 1816; pages from the first New Zealand printed books (1815 and 1820)’, along with the copybook pages from the 1820s noted above. They conclude with what they describe as the first independently written Maori letter, addressed by Eruera Pare Hongi ‘e te tini rangatira o ropi’ (‘to the many chiefs of Europe’) in 1825. It is hard to imagine the shock experienced by Maori who first heard written words speak in the local language. The startling fact about writing was that Pakeha marks could ‘say’ Maori words; Pakeha texts could have Maori meaning. It was one thing that European visitors had strange objects, language and activities; it was quite another that some of those activities could ‘speak’ in the language of the ordinary people. Existing Maori texts such as ta moko (tattoo); markings on rock, wood and sand; and carvings in wood, stone and bone had complex and detailed meanings, but none could speak as directly or literally as words did. Written words must have appeared magical. (p 9). Many of the historical figures and sources that feature in Words Between Us were familiar to me from my own research. Yet throughout Jones and Jenkins cast well-known incidents in a fresh light through their particular focus on language and writing. They also succeed in casting Samuel Marsden’s Parramatta settlement as a much more crucial site of early Maori and Pakeha encounter than has perhaps hitherto been appreciated. Jones and Jenkins are careful to emphasise Maori agency throughout. Whereas an earlier generation of historians tended to see things in terms of a one-way transmission of knowledge and new skills (the missionaries bringing literacy to grateful yet largely passive Maori communities), they view the emergence of a written Maori language as a much more collaborative process in which key Maori individuals taught the missionaries as much, if not more, than vice versa. Thus Samuel Marsden’s first sermon on Christmas Day 1814 is recast instead as his patron rangatira Ruatara’s speech, Thomas Kendall and other missionaries are deliberately and patiently educated in te reo and tikanga Maori by the northern tribes, and young Maori children attending the missionary schools improve upon the 1820 Grammar and Vocabulary of the Language of New Zealand (itself the product of extensive Maori input). The approach is a sound one, and the authors’ achievements are rendered all the more impressive by the fact that neither is a professionally-trained historian (both are educationalists). It is a testament to the quality of their scholarship that this would be difficult to discern if one knew nothing about their backgrounds. Yet I had a few quibbles with the book. On a very minor note, reference to the ‘hapu Rongowhakaata’ (p 9) should surely be to the ‘iwi Rongowhakaata’. On a more serious note, to suggest that Te Pahi’s involvement in the Boyd affair ‘remains uncertain’ (p 36) runs counter to the considerable body of evidence that the rangatira had no involvement in the killings. As I discuss in The Meeting Place, the weight of evidence points to the fact that he arrived at Whangaroa after most of the Europeans had been killed, unsuccessfully pleading on behalf of those who remained alive. His complicity or otherwise in the killings was made the subject of detailed investigation by the missionaries and others after 1814. John Nicholas commented that ‘George [Te Ara], the head perpetrator of that shocking deed, and who could have no motive in deceiving us, but on the contrary, would be glad to exculpate himself, by throwing the blame on Tippahee, or any other chief, declared to us most unequivocally, that he had no concern in it whatever.’ Thomas Kendall concluded likewise, observing that ‘The natives of Whangaroa, while they acknowledge their own cruelty, universally assert that when they were killing the sailors Tippahee held his hand over his eyes and shed tears.’ (The Meeting Place, p 62). The evidence also suggests that he was not killed in the revenge attack launched by various Europeans in 1810, as the authors state (p 67), but instead was wounded in that incident, before being killed in intertribal warfare soon after that was an outcome of the Boyd affair. The other issue I had with this book is that, after some 200 pages spent telling us just how significant Maori literacy was, and what a prominent role Maori took in ensuring it was achieved, the five-page conclusion seems to dismiss the power of Maori writing. Jones and Jenkins comment that ‘The power of writing that Ruatara had understood when he asked for a teacher in 1813 had proved itself largely an illusion; it was not, after all, a tool to ensure tino rangatiratanga, authority and mana in Maori engagement with Pakeha.’ (p 202). While that is true on one level, it also seems beyond doubt that without Maori writing there would have been no Kingitanga or Kotahitanga movements. And there certainly would not have been the vibrant Maori newspaper scene of the nineteenth century that has been so well explored by Lachy Paterson, Ngapare Hopa, Jane McRae, Jenifer Curnow and others. Newspapers such as Te Wananga proved vital instruments in a vibrant late nineteenth-century Maori political culture that was crucial in ensuring the ultimate colonising goal of total assimilation was never achieved. In my view, the authors sell themselves short in downplaying just what an important story they tell. Maori writing could not halt or reverse the process of disempowerment and displacement, but it did play a role in ensuring Maori survived as a distinct people. Yet none of this should detract from what the authors have achieved. Words Between Us is a lively, well-written and impressively researched book that deserves a wide readership. Historians of early Maori and Pakeha encounter, besides educationalists and other readers, will find much of value here. Finally, I should also note that, at a time when many publishers are tempted to cut corners on production values in the interests of cost-savings, Huia Publishers have done full justice to the quality of the scholarship, producing an attractive book, printed on glossy paper and with beautifully reproduced illustrations. All considered, a great book to hold and read.